In this video from FreeVisionInfo.com, progressive, no-line bifocals are explained. 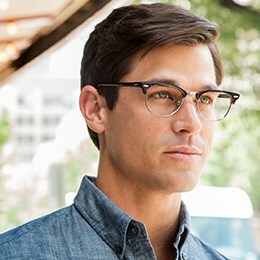 Progressive or no-line bifocals are lenses that are without the bifocal line. The optical centers of the lenses are placed directly in line with the pupils and as you move your eyes down the lenses, your vision automatically clears, allowing you to read up close without any noticeable difference. It's truly a remarkable technology. Want to get these alerts immediately? Just sign up to follow us on Twitter at http://www.twitter.com/framesdirect. Check out our Facebook page, too.